That's not a happy 'wow', a pleased or even a sympathetic wow. That's a horrified wow in the extreme. I hadn't wanted to watch this movie and there was absolutely no way on earth I was going to pay to support it. (I didn't need to see it to know that I would loathe it.) 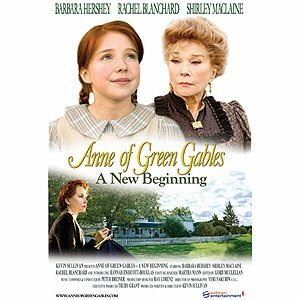 However, I ended up finding a copy of Anne of Green Gables - A New Beginning* at the library. I was willing to horrify myself for free (excepting, of course, the fact that my taxes went to purchase a copy of this treason.) Anyway, there are spoilers in my thoughts here. But as far as I'm concerned, you can't spoil what's already spoiled so I'm not going to feel guilty about this at all. I believe the point of A New Beginning is to -- no, wait. I don't know what the purpose is. I can't tell exactly what Kevin Sullivan's intent was in bringing this creature to life. I'm kind of assuming that he just wants to keep making a profit off of Anne, but Megan Follows is growing older and he already goofed by making The Continuing Story so what's to lose? I think the saying, "It could always be worse!" is very fitting in this case. I almost feel like saying The Continuing Story was ok in comparison but I'm not going to lie about that one either. Films three and four are dreadful. But this one? Should we even say it's a fourth Anne film? I mean, can we really do that?! I submit that we cannot! "I've always needed to write. I've made up stories about myself all my life. . . . I did it so often and for so long it's hard to know what the truth is anymore." ~ "Anne"
Indeed. Indeed, it is! That's the sad thing. Apparently we've been wrong about Anne's history and past all along. Turns out she wasn't an orphan at all. Her father was a drunken lout who caused her mother's death. Her father disappeared and "Anne" was sent to live in an insane asylum where the directors of the place refer to her as being devilish because of her red hair - which they chop off while feeding her and the rest of the inmates bad theology. "I had never experienced hypocrisy before. It was incomprehensible to me how a loving God would abandon me." ~ "Anne"
It's bad form to have a drunkard and a murderer for a father and so "Anne" starts making up stories about herself so that she'll be better accepted in society. That's why we all think certain things about her. Now, it seems, "Anne" is a playwright and she is trying to have her play produced. She writes books and plays because she's so used to making things up to hide her past. Basically she's a liar in this film and cheerfully admits it which totally rubs me the wrong way. Worse things happen. The movie is horrible. Anne's father remarries (Mrs. Thompson - mentioned above) and Anne ends up having a half-brother she doesn't discover until later in life. She also has some sort of male companion who keeps her company post-Gilbert. It was filmed in part on Prince Edward Island and so the scenery is pleasant to look at. I kept the movie for the entire two weeks which I was allowed to have it in my possession -- which means that no one else could watch it and be warped by it during that time frame. I like to think I've saved at least ONE local person from watching this. Maybe more - local and otherwise - if I blog about it. *I provided the link to the movie on Amazon for one simple reason. There are some hilariously worded comments throwing Sullivan under the bus for producing this film that I heartily agreed with. It's something of a soothing balm to know that I'm not the only Lucy Maud Montgomery fan that's willing to pitch fit over this ...this....THING! LOL---Literally, I'm LOL! I love how you kept this movie for the full two weeks to save anyone else from watching it. Now if you could check it out again and conveniently "lose" it! I'm with you---WHY would someone feel the need to make this disastrous movie? Who else will buy it? UGH! You should put your two cents on Amazon if you didn't already! I've lost all respect for Sullivan. If he wants to write fictitious characters and plots, he's free to do so, but he should make up his own characters and not hijack established and well-loved ones. No interest in watching it, but your review is hilarious. I especially like your point that no one else was able to watch it while you had it which is a positive! Funny. I hadn't heard of this one, but agree about the third one. Yuk! The second one is my favorite all the way! Oh my. Oh my. That is just terrible. Poor Anne!! I didn't want to see this for the same reason as I didn't want to see "Continuing Story." Anytime a filmmaker or author takes a classic story and makes up their own additions, it's usually bad! Thanks for saving us any remote possibilites of the temptation to watch it :) And for keeping it out of the library just a little longer. Umm...as a librarian, I have to jump in, here. If you 'lose' an item, we will make you pay for it, but that money goes into the general fund. Then we have to use our budget money to buy a replacement copy, which means there is one less new item we can purchase - and which might be something you wanted! I personally wouldn't lose anything just because I am not sure that the library purchases books from reasonably-priced places! Before anyone gets unnecessarily angry at the idea of my (or anyone else) simply "losing" something that they don't like, let me make it clear that my non-rocket-scientist mind wouldn't even begin to think of it. If I'm going to be mad about where the library spends their money, I'm going to mad about their sources, which are clearly not MY sources (i.e., Amazon) and an exorbitant waste of funds. When I was a school media specialist (a.k.a. librarian) I preferred to buy library bound materials from specialized companies like Bound to Stay Bound or Perma-Bound because those books should hold up better than those not meant to circulate. Also, most libraries charge a flat processing fee for replaced materials to cover the expense and time it takes to prepare materials for circulation (i.e. Stamps, stickers, labels, barcodes, not to mention the time it takes to do all that!). That is most likely why the replacement you paid for cost more than what the item hoes for on Amazon. Now! Don't you feel enlightened?!?! :-). I'm enjoying this conversation! I feel like I can say that in all fairness because I'd much rather build a home library than have to visit the local one. I always forget to get things back in time, and by the time I've paid the late fees, I could have bought us a new book anyway. And then I know exactly where my money is going and for what and I just like that more. I know that this is almost sacrilegious to say but -- I'm not actually a fan of the library. I use it every now and again, always for kid books and never my own stuff, and have a "meh" feeling towards it. And now you can argue about how there are a lot of people who need the library system, etc., etc. I'm not of the opinion that libraries will save society so I am kind of resistant to such arguments. As for using libraries, we use our local library A LOT. As home schoolers I rely on our library for easy readers and supplements for our history and science curriculum. And to keep my voracious reader in books. I simply can't afford to buy enough books for him to read. But I do understand the pain of paying late fees and lost fines. Been there, done that. My hubby gets really annoyed with me about it. I just consider it my service charge and that it's cheaper than buying the hundreds of books we use in a year. I watched 15 minutes of it and couldn't stand it so turned it off. Your positives cracked me up. Love that you dusted off the soap box and jumped right on, no holds barred! So funny!! I especially laughed at the golf part. Even though I don't know much about Anne yet, I couldn't imagine that. I really do hate that it's a horrible movie, though, because I love watching Shirley Maclaine. I've read through the comments, too, and I'm thrilled that I'm not alone with the library. I've tried!!! I want to like the library, and I do at times, but I'd still rather have my own books. :) I just get too easily frustrated with them! This was a great review. I didn't even know this movie was in existence, but I'm glad I do! Not because I actually plan on watching it but more because I got to read this HYSTERICAL review. You were far kinder in your review than I would have been able to be. What an appalling movie. I watched this a couple of years ago. Didn't care for it at all. I'm a huge fan of the library- I buy about one adult book a year- and want to note that our local library has (I think) a $1 maximum fine on children's books. I don't enjoy rereading books and am THRILLED for my tax dollars to go to a service I use, vs. the many services for the needy that I (thankfully) do not use. Thanks for the warning. I saw that this movie was out on DVD and thought I might watch it one day. I love the original "Anne" movies, or at least the first two. I'll definitely be steering clear of this one. I thought by enclosing the word "lose" in quotation marks and ending my sentence in an exclamation point, it would be obvious that I was kidding about losing the book. Oh, wait a minute, we're on the internet and you can't see my facial expressions and hear the tone in my voice. Sorry for the confusion. I am not advocating losing library books on purpose. I'm with you, Carrie, about libraries. I love them but in our tiny little rural system it's next to impossible to get a wide variety of good reads. I'd much rather own books, myself, and have found enough ways to get them very cheaply. We use the library when Peter has a project at school, but when it's a huge 500 page book he wants to read, like Inkheart, it makes more sense for us to just buy it for him, so we don't have to worry about getting it back on time or interrupting his reading. ;D MB - I am totally laughing. It honestly would have never crossed my mind that you would advocate losing library materials for real. No worries on this front. And a big high five to Bluerose who admitted that she also does not like using libraries. =D I'm so glad I'm not the only one. See? And I'm pretty picky about my tax dollars in general. I tried to watch this movie a couple years back. All I can say is: 1. I shut it off a few minutes in. 2. It was horribly bad. 3. Don't waste your time... oh wait. Sorry!